"Clearly, we were not open and they knew what they were doing." 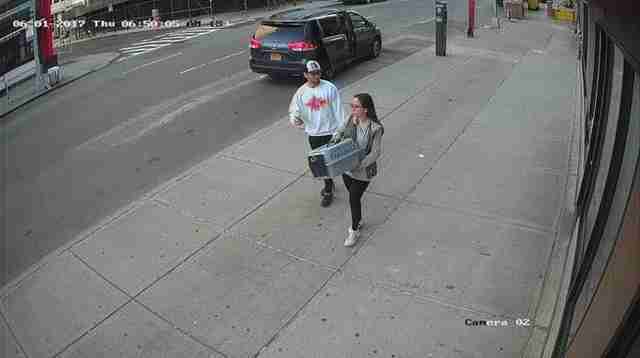 It was just before 7 am on Friday morning when a man and a woman approached a closed New York City animal shelter in lower Manhattan with two cat carriers. Security camera footage shows the man placing the carriers in front of the closed door of Animal Haven, first one on top of the other, and, on second thought, side by side, so that the cats being abandoned could look at each other from inside their carriers. An hour later, Animal Haven staff came to the site to open up the shelter for the day — and found two scared cats waiting right there on the sidewalk. "They appear to be Russian blue mixes and were obviously terrified,” Animal Haven wrote. "Clearly, we were not open and they knew what they were doing,” Tiffany Lacey, executive director of Animal Haven, told The Dodo. And considering how crowded shelters can be, abandoning animals this way puts an extra strain on already limited space. Luckily, the two cats are safe. And hopefully they'll have a real forever home soon. "They're gorgeous," one commenter wrote. "I hope someone adopts them together." If you would like to adopt these or any of the other beautiful cats at Animal Haven, you can learn more here. You can also donate to Animal Haven to help the shelter save more animals.